Swansea City came from behind to beat Millwall at The Den, despite playing 85 minutes of the game with 10 men. Forward Courtney Baker-Richardson, making his league debut for the Swans, was shown a straight red card for a lunge on James Meredith. Murray Wallace headed Millwall in front from Shaun Williams' corner, but Kyle Naughton equalised when he found the bottom corner from the edge of the box. The Lions pushed forward again, but Oli McBurnie put the finishing touch on a swift break to give Swansea an unlikely victory. Tom Elliott was still inches away from rescuing a point for Millwall in the final minute of stoppage time, but his header struck the underside of the bar and bounced agonisingly the wrong side of the line. The hosts had dominated possession but failed to threaten in the first half, with Steve Morison slicing their best chance wide. Swansea were angered when Jed Wallace avoided a red card shortly after the break for a similar challenge to the one which had seen Baker-Richardson dismissed. And they were behind soon after when Jake Cooper flicked Williams' corner on for Wallace to head home. Having been content to sit back after being reduced to 10 men, Swansea equalised with their first shot on target, Naughton turning out of pressure and drilling past Ben Amos. 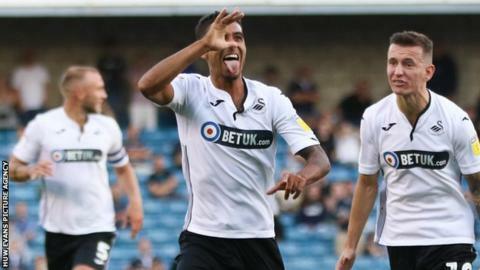 Millwall were left short at the back as they threw men forward in search of a winner, Jefferson Montero and Bersant Celina combining to give McBurnie a simple tap in. Tom Carroll almost made it worse in added time, his long-range effort rebounding back off the post. "I thought we offered a threat, as much as you can with 10 men. I thought we played with real courage - the players were wonderful, amazing. "I'm very proud to be the coach of Swansea City today because I thought we were magnificent. "Their goal was a bit disappointing because it was from a set-play. Apart from that, I didn't think they created so much - there was pressure, there were balls coming into the box and there were things that you have to deal with." "When I saw the sending-off live, I think it was one of them that you know you're in trouble. "There was no malice in it from Courtney's perspective - he's just making his debut, very excited and he's gone to challenge and it's not a good challenge." "If anyone in the ground had seen that coming, I wish they would have told me. "Of course you're going to make the odd poor decision as an individual and as a group, but Swansea dug in and made it difficult to break them down. "When you get your noses in front, I couldn't see us conceding and we never looked in any danger. There's always a threat of a counter-attack, but it never looked like it was going to come. "We've got enough leadership in the group to manage the situation, but you can't explain individual errors. "Without naming names, did the players do enough when we didn't have the ball in the last 15 minutes? Did they do enough to make sure we didn't concede? Well, they didn't." Match ends, Millwall 1, Swansea City 2. Second Half ends, Millwall 1, Swansea City 2. Tom Elliott (Millwall) hits the bar with a header from the centre of the box. Assisted by Jiri Skalak with a cross. Corner, Millwall. Conceded by Matt Grimes. Offside, Swansea City. Tom Carroll tries a through ball, but Bersant Celina is caught offside. Tom Carroll (Swansea City) hits the left post with a left footed shot from the centre of the box. Assisted by Jefferson Montero. Offside, Millwall. Jed Wallace tries a through ball, but Tom Elliott is caught offside. Substitution, Millwall. Tom Elliott replaces Mahlon Romeo. Jefferson Montero (Swansea City) is shown the yellow card. Attempt blocked. Jed Wallace (Millwall) right footed shot from the centre of the box is blocked. Assisted by Steve Morison with a headed pass. Goal! Millwall 1, Swansea City 2. Oliver McBurnie (Swansea City) right footed shot from very close range to the bottom right corner. Assisted by Jefferson Montero with a through ball following a fast break. Offside, Millwall. Shaun Williams tries a through ball, but Mahlon Romeo is caught offside. Attempt missed. Jiri Skalak (Millwall) right footed shot from the right side of the box is close, but misses the top left corner. Assisted by Jed Wallace. Attempt missed. Lee Gregory (Millwall) right footed shot from the centre of the box misses to the left. Assisted by Steve Morison with a headed pass. Goal! Millwall 1, Swansea City 1. Kyle Naughton (Swansea City) right footed shot from outside the box to the bottom left corner. Assisted by Jefferson Montero. Attempt missed. Tom Carroll (Swansea City) left footed shot from the right side of the box misses to the left. Corner, Millwall. Conceded by Connor Roberts. Substitution, Swansea City. Jefferson Montero replaces Martin Olsson because of an injury. Delay in match Martin Olsson (Swansea City) because of an injury. Goal! Millwall 1, Swansea City 0. Murray Wallace (Millwall) header from very close range to the bottom right corner. Assisted by Jake Cooper with a headed pass following a corner. Corner, Millwall. Conceded by Tom Carroll. Substitution, Swansea City. Tom Carroll replaces Daniel James. Attempt missed. Jed Wallace (Millwall) right footed shot from outside the box is high and wide to the right. Assisted by Ryan Tunnicliffe.